Food Costs > How Much Does Dry Ice Cost? Dry ice is frozen carbon dioxide and is commonly used to transport items that need to be kept cool. 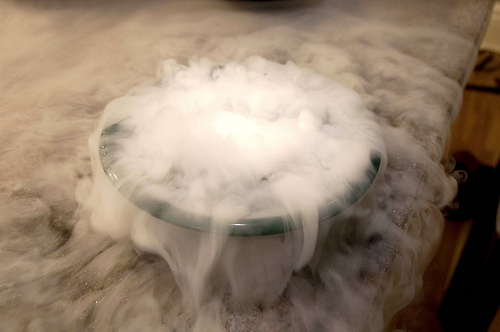 Dry ice received its name since it changes from a solid to a gas and will never melt into water. It’s a versatile product that has many uses for a number of consumer and commercial uses. The price of dry ice will depend on where you purchase it, but in most cases, the price will be about $1 to $3 per pound. If you were to buy in bulk, which is often available in 50-pound block forms, then the costs can drop to about $30 to $40. At Meijer, for example, a popular grocery store chain in the Midwest, they sell their Penguin branded dry ice for $1.69 per pound. Walmart sells the same brand for a similar price, around $1.50 per pound. DryIceDelivered.com will deliver dry ice to your doorstep, but they do require a 10-pound minimum. Their prices, according to their pricing list, range anywhere from $1 per pound if you purchase 10 to 24 pounds to as little as $0.50 per pound if you were to buy more than 250 pounds. Dry ice can be purchased at just about any grocery store, including Safeway, Albertsons, Fred Meyer, H-E-B, Kroger, Meijer, Publix, Walmart, Winco and Costco, but to play it safe, always call the store ahead of time to see if a location near you carries it. With a grocery store, most will sell the Penguin brand as mentioned above. When purchased at a local retailer, dry ice will usually come in 10-inch squares that are two inches thick. Each square, on average, will weigh close to 10 pounds. An insulated cooler is a must when transporting dry ice, and as a general rule of thumb, plan on storing 20 pounds of dry ice inside a 40-gallon cooler. Since this cooler is much cooler than the average freezer temperature, an insulated cooler can keep it much cooler. Generally, the thicker the insulated cooler is and the tighter the seal is, the slower the dry ice will disappear. A simple styrofoam cooler, if you don’t have one, will generally retail for about $20 to $30. When buying dry ice, always try to purchase it as soon as you need. Since it has a very short shelf life, you can plan on every five to 10 pounds of dry ice turning from a solid into a gas. DryIceInfo.com recommends using 10 to 20 pounds per 24 hours. If left outside of the cooler, it may only last a few hours, depending on the conditions. Never handle dry ice with your bare hands. Even though brief contact is harmless, it’s always wise to wear leather gloves to avoid freezing your skin cells. If you don’t have access to leather gloves, an oven mitt or even a towel can suffice. Refrain from storing the dry ice inside of a freezer as this will cause the freezer’s thermostat to drop, effectively shutting it off and putting the food inside at risk. When you’re done with dry ice, the University of Vermont recommends letting the unused portion sublimate in a well-ventilated area. Never dispose of it in a sink, toilet or another device. The more you purchase at once, the more you can save. Generally, when you start to purchase more than 50 pounds, this is where the savings start to kick in.